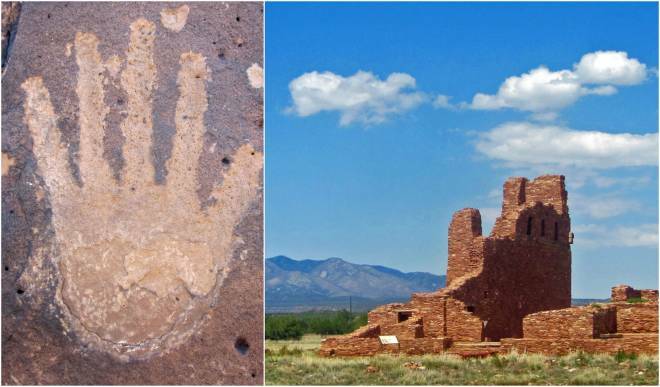 An anthropologist came to New Mexico to study ancient petroglyphs and fell in love with the people she met. The petroglyphs of Salinas Pueblo Missions tell an ancient story. SINCE MY FIRST visit to Mountainair and the Salinas Pueblo Missions National Monument in the late 1960s, the area’s reddish sandstone and crystal-blue skies have drawn me back, time and again. I have fond memories of friends I made, although sadness tugs at my heart because those dear friends are no longer among us. Seldom in life is a person lucky enough to build bonds with people who are so warm, friendly, and down to earth. For years, friends near the monument’s Abo unit let me camp, usually alone, on their remote ranch at an old adobe house that was slowly deteriorating. Nearby, a windmill pumped water into a large tank stocked with goldfish to help keep it clean. These fish grew very large. Looking into the tank, you could see flashes of bright gold as they darted around. My reason for being there was anthropological research—locating and recording the many petroglyph and pictograph panels sprinkled throughout the region. After a day’s work, as I rested on the porch steps in the fading daylight, I could hear the sucker rods of the old wooden windmill lifting water. One year, the sound was gone, and I realized the windmill had been replaced by a metal one that pumped silently. I missed that old wooden windmill. I felt that a part of the ranch I had grown to love had disappeared. The lonely sound of trains whistling at the Abo Crossing drifted across the land and often incited the howling of coyotes. In the twilight, swarms of bats magically materialized, sometimes diving right by my head, as they swiftly captured their evening meal of insects. The air cooled, and a cow or two would lumber in to drink water. After slurping it up, they would lift their heads to look at me, water dripping off their chins, then turn and disappear into the shadows. Lonely? No, I never missed human contact, and I enjoyed the swallows nesting on the exposed interior vigas. At night, as I lay in my sleeping bag, I listened to the pack rats scurrying back and forth in the attic. Also called “trade rats,” the rodents collect items to add to their nests and sometimes leave others behind. One day, when I went to fill my Coleman stove with liquid fuel, I discovered that my small aluminum funnel was missing. I had left it on an open shelf, and in its exact spot was a large wood chip. Perhaps the pack rat considered it a fair trade. Me, not so much. My research soon grew into the idea for a book, giving me years’ worth of reasons to return and study more petroglyphs. Numerous panels that I found contained snake symbols. The rancher always warned me to be careful near one natural spring because of the large “Scholle rattlesnakes” (named for a nearby railroad town). Dead ones, up to five feet long, hung over pasture fences. In 2005, Mike Rooney and I visited the area so he could take pictures for a book I was writing about petroglyphs. Near the end of our second exhausting day of hiking, I was out of Mike’s sight when I heard a warning buzz. I looked down to see a large Scholle snake, coiled and ready to strike. “Mike! Rattlesnake!” I hollered. His bored response: “I already have a lot of pictures of snakes.” I yelled, “It’s a real snake this time!” Mike popped over the rocks and snapped its picture before we moved on, leaving the fellow to resume its sunbath on the warm sandstone. I was raised in Topeka, Kansas, and returned to live there years ago. The petroglyph book is published (look for it at the national monument: Symbolism of Petroglyphs and Pictographs Near Mountainair, New Mexico, the Gateway to Ancient Cities), but I still return to New Mexico whenever I can. One recent autumn, one of my many only-in-NM moments occurred as Mike and I took pictures of petroglyphs that seemed to represent sandhill cranes. Suddenly we looked up and saw a flock of them flying to the Bosque del Apache—my first glimpse of cranes! For me, coming home to New Mexico lies in such experiences, especially among the people I encountered over the years. They affected my life as no one else has. Some days, I would return to the old ranch house from hiking and find a jug of drinking water that had been left for me—water that had to be hauled from a cistern on the other side of the ranch. Where else would you find such thoughtfulness and kindness? Even now, I anticipate my next New Mexico visit as I treasure these and many other loving memories. They will always occupy a special place in my heart.